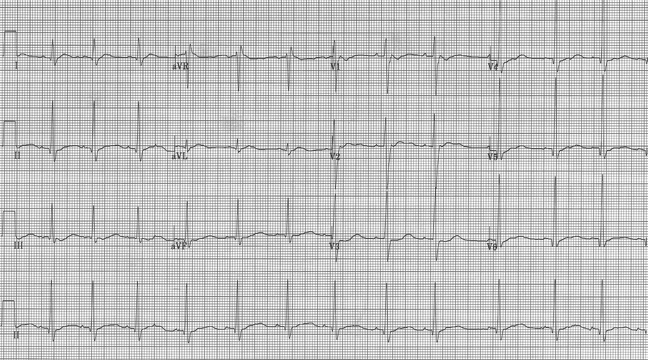 What do you think about this EKG of a 63-year-old man experiencing chest pain whenever he walks across the room? This should be a striking EKG, and in fact should send shivers down your spine! There are significant ST-segment depressions in many leads (I, II, aVL, III, V2-6) as well as ST-segment elevation in aVR. This EKG is the classic example of critical left main occlusion, and should be considered a “STEMI equivalent.” This patient should be referred to interventional cardiology, as this patient was! They took him to cath, and indeed found a 99% stenosis of the left main coronary artery; they inserted an IABP to support his pressure and alleviate symptoms, and got an emergent cardiac surgery consult for CABG. The surgery was accomplished and the patient did very well. 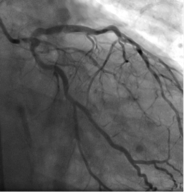 Critical occlusion of left main coronary artery. 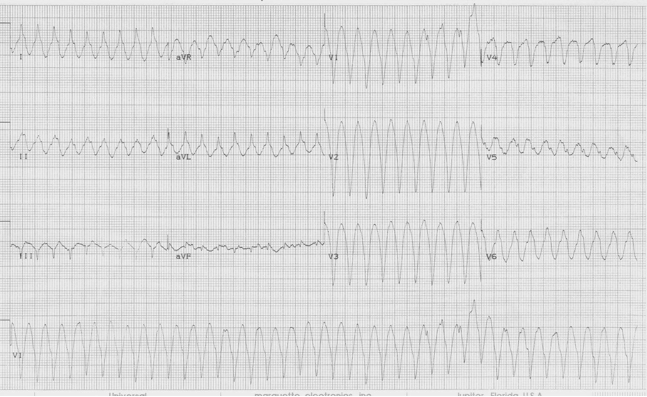 Wellens described this EKG finding many years ago – ST-segment depression in ≥ 8 leads and ST-segment elevation in aVR. This is particularly specific if there is also ST elevation in aVL. 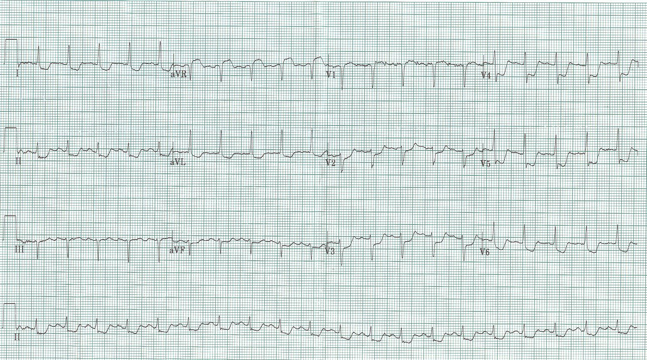 50-year-old man with palpitations and chest tightness. This rhythm is a regular wide-complex tachycardia. By definition, this rhythm is ventricular tachycardia until proven otherwise. Fully 70% of WCT is v. tach. Other causes of WCT include SVT with 1) rate-related changes (aberrancy), 2) pre-existing bundle branch block, or 3) antidromic conduction down a bypass tract (WPW). Some electrocardiographic clues that suggest ventricular tach include QRS concordance (QRS complexes in chest leads all predominantly negative or positive), very wide QRS complexes (eg QRS > 160 msec with LBBB), extreme right axis (-90° to ±180°), and evidence of AV dissociation. And in an emergency, treat wide-complex tachycardia (WCT) per current ACLS protocols. A 14-year-old boy with newly diagnosed Graves disease presents with profound generalized weakness. The ST-segment and T wave changes on this EKG can be explained by hypokalemia. As potassium levels decline U waves appear following the T wave. At the same time T waves will diminish. When severe, the T wave may disappear and a prominent U wave can be mistaken for the T wave, thus one of the reasons that hypokalemia is always included in a differential for prolonged QT interval. This young man was extremely hypokalemic, with a K+ of 1.7mEq. Pediatric endocrinology came up with an interesting diagnosis – thyrotoxic periodic paralysis! His weakness improved with repletion of his K+ and further treatment of the thyroid disorder.